One classic road race beloved of Scottish distance runners was in England! (No, not just the London Marathon, which only started in 1981.) This was the Morpeth to Newcastle Road Race, which always took place on 1st of January, New Year’s Day. This caused a logistical problem for the drouthier runners – how could they endure a temperate Hogmanay? Some restricted themselves to a couple of drams but some carried on as ‘normal’ and used the event as a hangover cure. However many simply deferred the pagan celebrations until after the race. The best arrangement was to drive down the day before and spend two nights in Newcastle…….. 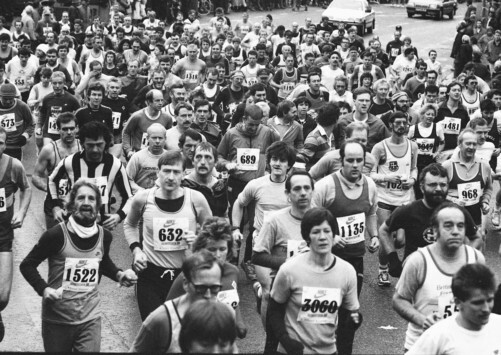 The Morpeth was the oldest road running event in the UK. It began in 1904 and attracted serious competition from all over the country. Originally the distance covered was 13.6 miles but this was later changed to 14.1 miles in 1983. Only as late as 2002 was it standardised as a half-marathon. Sadly, finance for safety precautions (i.e. the cost of policing) became a serious issue for the host club Morpeth Harriers. Tragically, the last Morpeth was run in its centenary year of 2004. There had been 90 runnings. Scots had a lot of success in the event. The most victories (seven) were recorded by Dunky Wright. Local hero Jim Alder won five times. Other notable Scottish winners were Donald Robertson, Fergus Murray, Jim Wight, Allister Hutton (the record-holder for the 14.1 mile course in 1.05.38) and Fraser Clyne. I first competed in this famous race in 1972, running for Victoria Park AAC. We travelled down by train. I remember reading the big build-up for the favourite Jim Alder, the Geordie Scot, in the local newspaper ‘The Journal’. There was an enormous field (for that era) of 209 runners, who had to be entered by 9th December. Most of us took the free bus from Central Station, Newcastle, out to the start, and then we left our kitbags in a van which departed for the finish, leaving us ‘warming up’ in the rain. The race started at 1.45 p.m. Once the fast men shot off, the rest of us struggled along as well as possible. My training diary noted: “Raining throughout and quite cold. Not 100% effort but legs and feet sore. Tried fairly hard. A reasonable run, considering my fitness.” Jim Wight from EAC outsprinted Jim Alder by seven seconds to win in 1.05.47. My team-mate Alastair Johnston was an excellent third in 1.05.56. I ended up 16th (1.09.11) and Willie MacDonald was 45th (1.13.23), well under the standard medal time of 1.14.30. Vicky Park finished third team and each of us won a frying pan worth £1! What I remember most is that the great Jim Alder, Commonwealth Marathon gold and silver medallist, modest, tough, honest and generous, actually walked his fellow Scots more than a mile to the train station, chatting away in his inimitable relentless fashion. My next participation was in 1988. I had just become a veteran and fancied having a go at making some sort of a mark on the famous race. Aberdeen AAC sent down a decent team of Fraser Clyne, Graham Milne and myself. The start was at 1 p.m. and the route went from Castle Square, uphill along Clifton Bank, through Stanington, up the notoriously long hill of Blagdon Bank, through Gosforth and down to Town Moor, before turning in to the Civic Centre. There were 1400 starters. The leading pack soon receded into the distance, leaving me hanging on to the second group. A real problem was trying to work out if there were any other veterans in the vicinity! I spent many miles trying to spot potential rivals and eventually thought that one guy in a Derby and County vest had significant wrinkles at the back of his neck. When speeding up during the last mile, I made sure that he was behind me. Right enough, he turned out to be Anglo-Scot Alasdair Kean, a former 2.16.51 marathon runner with a PB one second slower than mine! I was delighted to finish first veteran in 19th place (1.14.40) with Alasdair second vet, one place and ten seconds back. The Road Runners Club 1st Class Standard was 1 hour 16 minutes, so we both won gold medals. The winner in 1.08.33 was Paul Davies-Hale from Cannock Chase, a 25 year-old Olympic steeplechaser. Fraser Clyne was tenth in 1.10.39 and Graham Milne 40th in 1.17.42 (fifth vet). Aberdeen AAAC was pipped by four points for the team title by Bridgend Harriers. On this occasion the value of the prizes (for both 1st Vet and 2nd team) had gone up, compared to 1972, to £35! Unsurprisingly, since I love Hogmanay, I did not return to the Morpeth until 1993, having entered the M45 category. I stayed in Newcastle the night before with Jimmy Bell, a friendly M45 rival from Elswick Harriers. 1071 took part. We made a cautious start into a cold headwind and attached ourselves to the third group. Dave Hill, the M40 25k World Vets 25k champion, was well ahead, and Jimmy and I assumed that we would not see him again until Newcastle. However unknown to us he had stayed up drinking until 5 a.m., got a ‘stitch’ and we passed him on the big hill at seven miles! After 13 miles I tried to surge but could not drop Jimmy. The pace increased during the last three-quarters of a mile, I got a few yards on him, made two left turns and gasped over the finish line, three seconds up. Not only 1st M45 but 1st veteran again! My place was 16th, in a gold medal time of 1.15.25. Mark Hudspith of Morpeth Harriers had won the race in 1.10.24. Afterwards I enjoyed a great real ale crawl in Byker at the Ship Inn and the Cumberland Arms, with Archie Jenkins, Gordon Bell, Robin Thomas and Steve Beattie. In 1995 I was less successful, finishing outside the first class standard in 1.16.50, fourth veteran and only second M45. However the Byker pubs allowed me to drown any fleeting regret in excellent beer. My last Morpeth to Newcastle was in 1998. The day before I had driven down from Kemnay, near Aberdeen and had a couple of pints at The Keelman and The Bodega with my host Jimmy Bell. On race day I had a good chat with Jim Alder and then took the bus to Morpeth. 750 took part. It was important to start fast up the hill, since there was a very strong headwind in our faces the whole way. In a press photo, my Metro Aberdeen RC vest can be seen, straining to keep up with the fast men! We turned into the gale at one mile and I rested in the shelter of the second pack. Our pace was pretty slow for six miles, although it seemed tough to hang on at roundabouts and on Blagdon Bank. Only two from the group managed to escape. The final mile turned into a big tactical sprint-out, as we took turns to ‘play at Kenyans’. I finished two seconds behind Archie Jenkins (1st M45) in 15th place (1.21.23), but only seven seconds behind tenth place, so I was very pleased despite the slow time. 1st M50 and fourth veteran overall. The winner was Brian Rushworth of Sunderland in 1.15.30. At the presentation, the great Jim Alder called me ‘his old mate’ before handing over my prize! Afterwards, predictably, it was off with Archie and the usual crew to Byker – The Ship, The Free Trade and the Cumberland Arms. The lasting joys of distance running!